February 22, 2019 November 15, 2018 by Joel F.
We prefer to think of ourselves as invincible. Therefore, thought of Life Insurance does not cross one’s mind often. However, if you have loves ones who depend on your income, you should seriously consider getting personal life insurance. Individual life insurance policies can be very simple or quote complicated, depending on your needs. For example, young couple buying their first home may only need a simple Term insurance for the duration and amount of mortgage. Family with kids will need to consider long-term protection to ensure that the surviving spouses’ and children’s lifestyle is not compromised by the loss of one spouse. Retiring couple will need a product that will address estate planning needs. Business owner can utilize life insurance to safeguard operations against the loss of business partner. Those who already maximize other tax-efficient investment options, individual life insurance policy will be a great addition to their portfolio. Multiple cash value generation options and favourable tax treatment of income allow to structure an appealing investment policy. Most common types of life insurance are Term and Permanent policies. The main difference lies in the length of coverage. One shall also consider an opportunity to accumulate and access cash value, like in Whole or Universal Life Permanent policy. 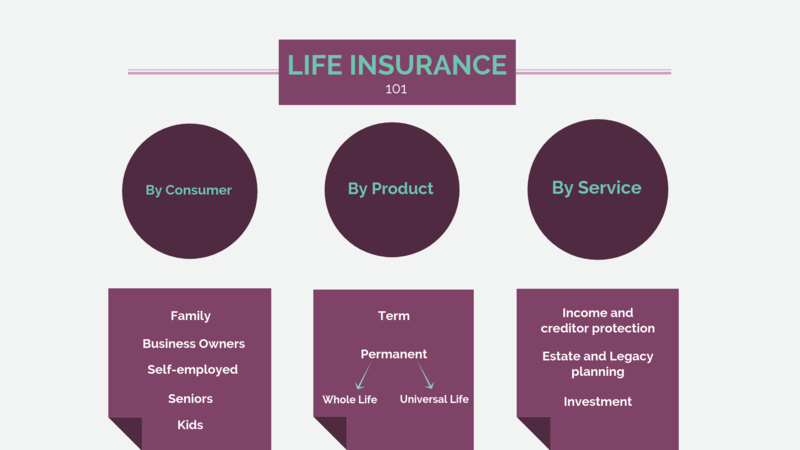 There are many ways to use life insurance policies, as demonstrated by the chart below. Any insurance purchase is an important decision, one that involves long term planning and thorough understanding of your needs and product options. We have a team of professionals with decades of experience who can answer all your individual insurance questions. Let us show you the path to secure future for you and your beloved! Individual life insurance rates will vary based on product of choice, person’s age and health. To ensure that you receive the best value, contact us today for the free personal life insurance quote.